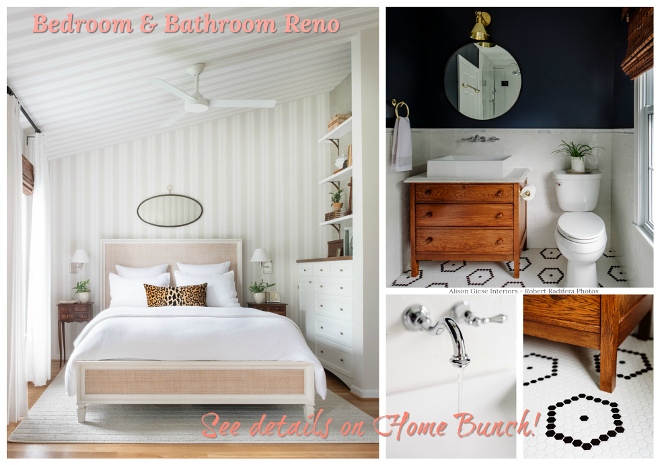 After almost ten years of blogging I can say that I have never featured a home I didn’t like here on Home Bunch. 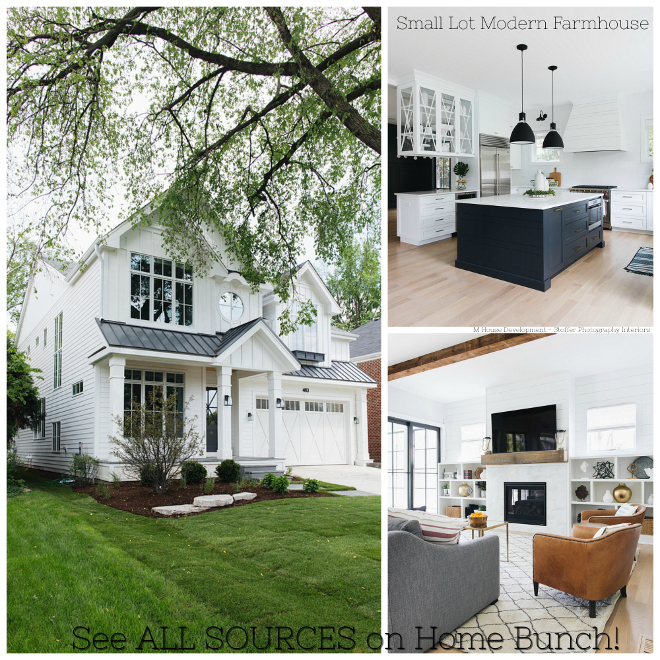 Interior trends come and go, new ideas appear, styles change, but the more homes you see and work with, the more you quickly understand as to which ones won’t be forgotten and this modern farmhouse is one of them. 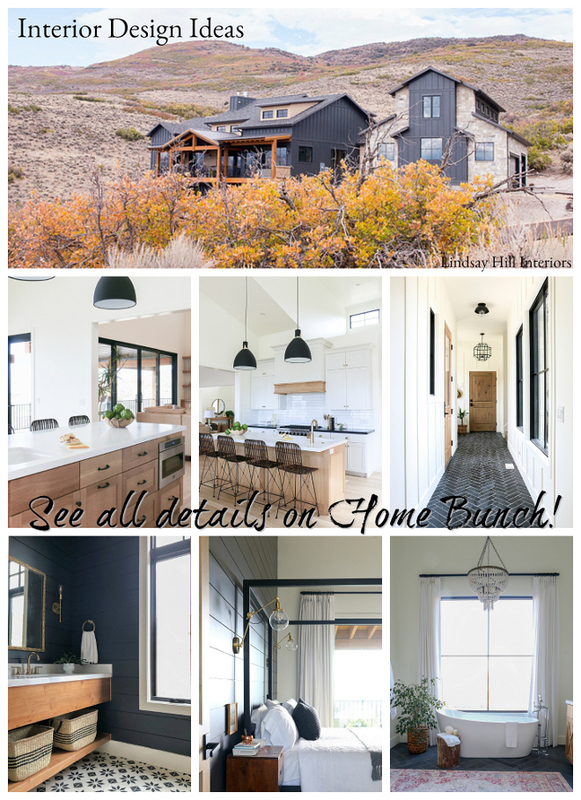 With interior design by Stephanie Gamble of Stephanie Gamble Interiors, this new construction is beautiful and inspiring from its curb-appeal to its decor. According to the designer, the clients are a super sweet (and hip) couple in their early thirties with a young baby. 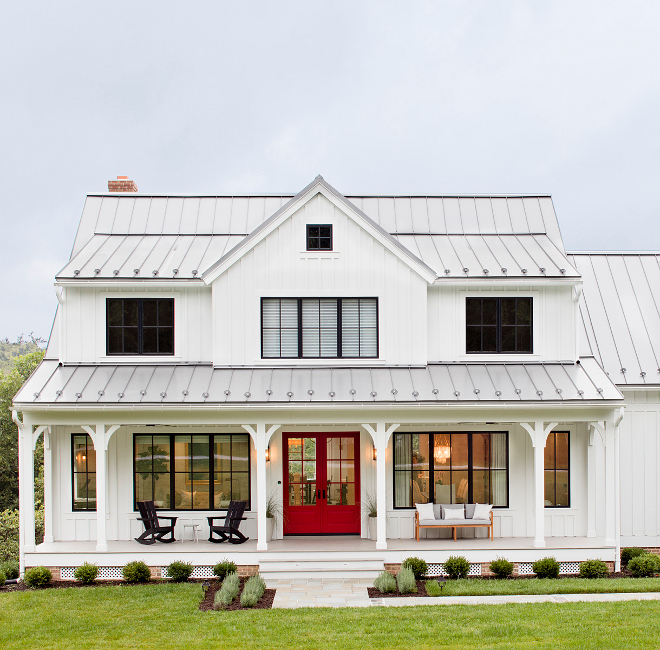 They felt it was more important to have a quality, well-built, smaller house rather than an enormous house where they would have had to compromise on finished details and quality. I think this is something that people should really prioritize! I want to thank Stephanie for kindly sharing all the information for this post. 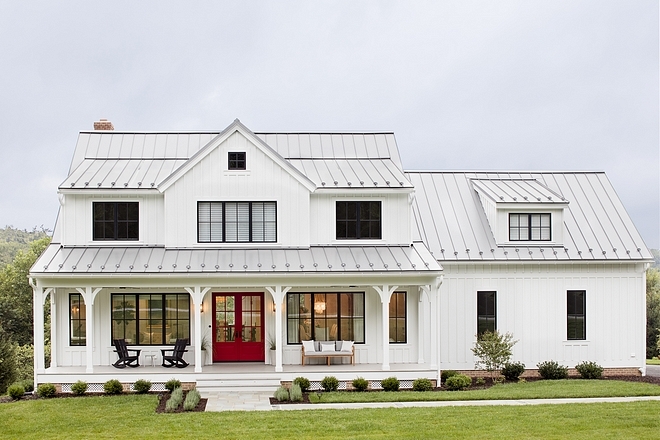 I hope you guys have a great time touring this beautiful modern farmhouse. 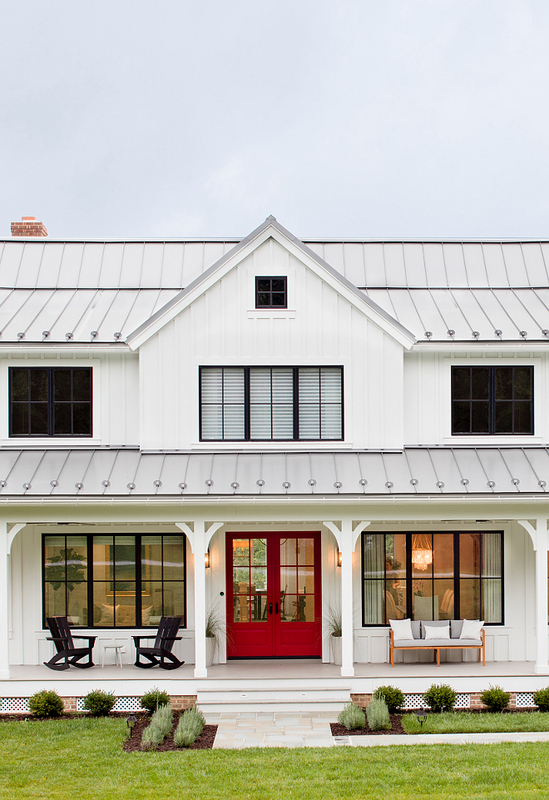 This stunning modern farmhouse features white board and batten siding, brick and black steel windows. The roof is metal. They feature snow guards, which help to keep snow and ice from falling. The interior designer worked closely with the homeowner and architect and had the front door customized. Although, she couldn’t confirm it, the designer believes the paint color is Benjamin Moore Exotic Red 2086-10. Outdoor Sofa: Terrain (no longer available)- similar here, here & here. Beautiful Outdoor Decor: here, here & here. 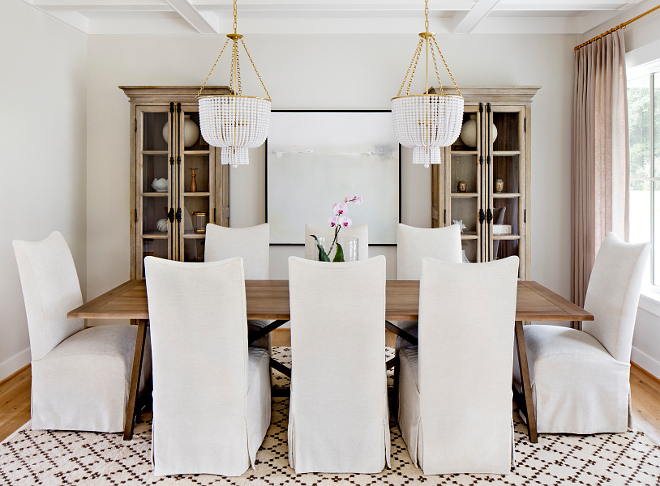 This is the type of dining room I love – it’s very comfortable and it feels collected without being too precious. Chairs: Lee Industries- similar here , here & here. Cabinets: RH – similar here. Similar Dining Table: here, here & here. Window Treatments Fabric: custom Kravet (available through the designer). Rug: Clients existing – similar here, here, here & here. Dining Room Table Decor: Instead of using a pillar candle, the designer added an orchid into the hurricane. Beautiful and simple. Lighting: Visual Comfort – Aerin. 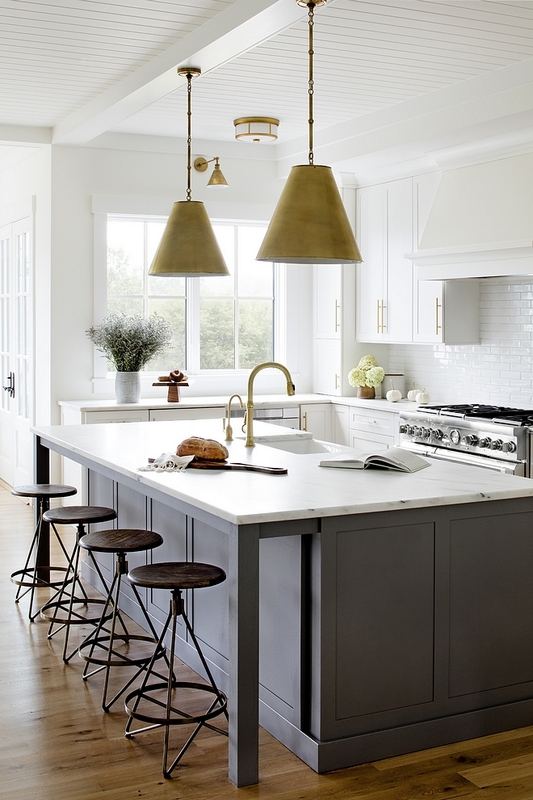 The kitchen features a dark grey island with honed white marble countertop, industrial backless counterstools, brass cone pendant light and V-Grove ceiling. The perimeter cabinets are painted in Benjamin Moore Simply White. Cabinets were manufactured by Rojhan. Backsplash: Handmade porcelain subway tile. Cabinet Hardware – Lew’s Hardware Bar Series – similar here. 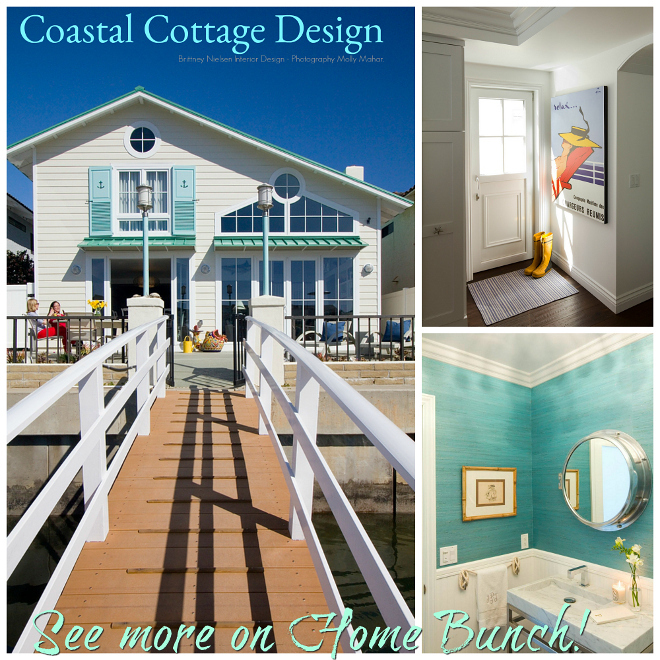 Lighting:Visual Comfort – Island Pendants – Sconces above Sink. 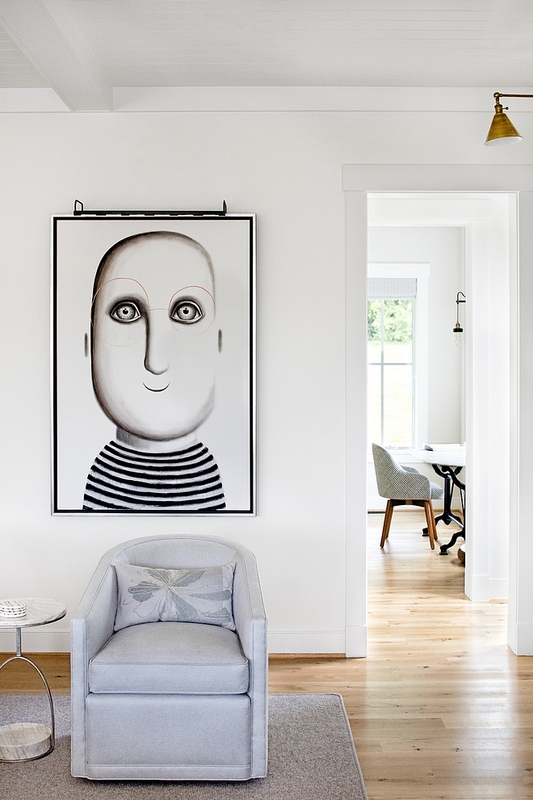 Ceiling treatment is V-Grove painted in Benjamin Moore Simply White, Satin finish. 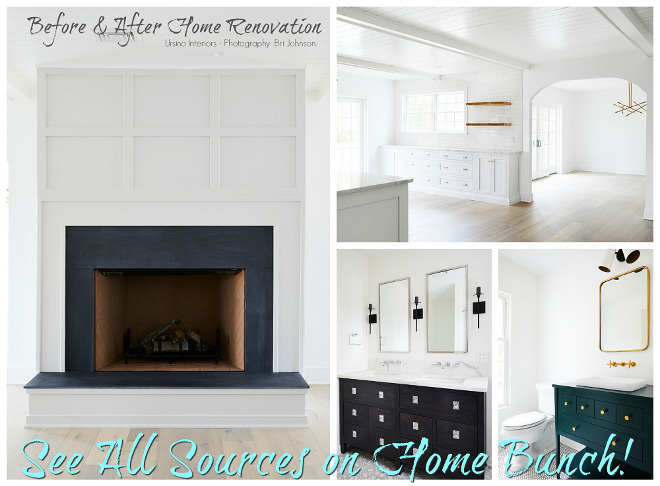 We used Benjamin Moore Simply White for all the walls, trim and ceiling. Chairs: Bernhardt Palma Woven Abaca dining chair – similar here & here. Similar Dining Table with metal Base: West Elm – similar: here. Curtains are custom – Similar Curtains: here. Similar Rods: here. The living room features a great layout and timeless furnishings. 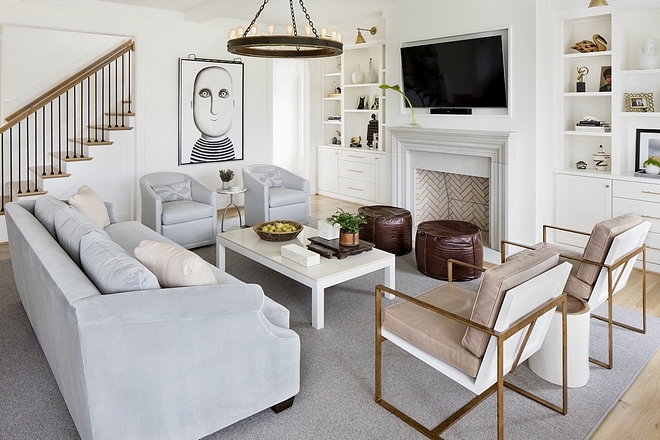 Fireplace Surround: Francois & Co.
Leather Poufs – Mitchell Gold + Bob Williams – similar here. Similar Grey Rug: Here, Here & Here. Chairs: Redford House Manhattan Lounge Chairs – Other chairs with metal base: here, here, here, here & here. Coffee Table: Mitchell Gold + Bob Williams – Others: here, here, here, here, here, here, here, here, here, here & here. Swivel Chairs: Wesley Hall – similar here, here, here & here. This dreamy master bedroom feels bright and airy. Notice the peaceful view outside. Bed: Custom- similar here & here. Bedding: A mix of Pottery Barn and Pine Cone Hill. Side Tables: Phillips Scott – similar here & here. Window Treatments Fabric: Mark Alexander. 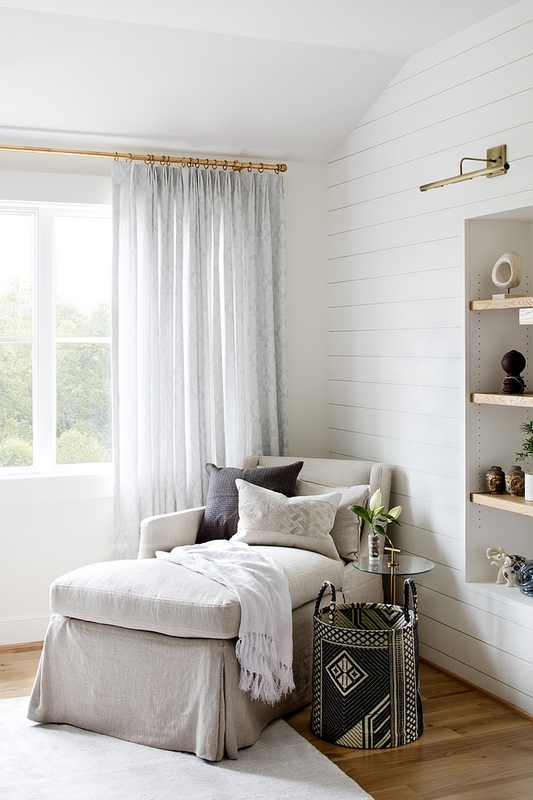 The bedroom also features shiplap, bookshelves and a sitting area with an inviting slipcovered chaise. Chaise: Cisco Brothers – similar here. All of the decor items were sourced through the designer’s showroom The House Downtown. The architect is Peter Ratcliffe of Ratcliffe Architects and the builder is Paglia Contracting. The photographer on this project is Jennifer Hughes. Another wonderful post, Luciane. I started blogging about the same time as you! Have a wonderful Christmas with your family.